"Fox & Friends" apologized Monday after airing a graphic that incorrectly implied Supreme Court Justice Ruth Bader Ginsburg had died, blaming the mixup on a "technical error." 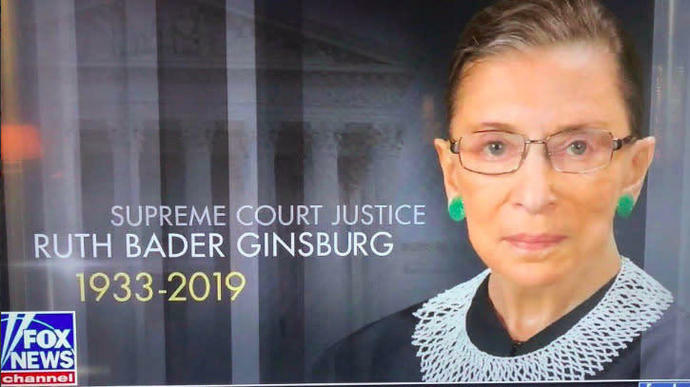 The image showed the dates "1933-2019" under Ginsburg's name and next to her portrait. It flashed on screen for a few moments before cutting to host Ainsley Earhardt's interview with a college professor about campus culture. "We need to apologize," said host Steve Doocy. "A technical error in the control room triggered a graphic of Ruth Bader Ginsburg with a date on it. We don't want to make it seem anything other than ― that was a mistake. That was an accident. We believe she is still at home recovering from surgery. Big mistake." "We apologize," Earhardt reiterated. "Big mistake." She missed oral arguments this month for the Supreme Court's first case since her operation. It was the first time she missed arguments since she was appointed to the high court in 1993. The Supreme Court announced Jan. 11 that Ginsburg's recovery is "on track." In a decision that could further help companies limit damages in employment disputes, the U.S. Supreme Court on Wednesday ruled against a California man who was the victim of an online scam targeting his employer and sought to bring claims on behalf of a group of workers instead of just himself. In a 5-4 decision with conservative justices in the majority, the court overturned a lower court ruling that had allowed for the collective arbitration of the workers' claims. The justices agreed with the man's employer, lighting retailer Lamps Plus, Inc, which had argued that the arbitration must be conducted on an individual basis only.